I finished this cowl a while ago (last March) but have yet to post about it (I think that was mainly because I yet to take a picture of it). Can I say how much I love this project? It's so simply and the result is so pretty! I get compliments on it all the time (I think it's the ribbon). The one issue I have is with the yarn and gauge - it has stretched out a little with wear, but that's more my fault, I shouldn't have made rectangle so long. I definitely plan on making another one of these in the future. I am so proud of this cardigan! I've already worn it a few times and it is so nice and cozy. I do worry a little bit about the pilling but so far it doesn't seem too bad. I made quite a few modifications to the pattern so that it covers more in the front, all of which are recorded on my project page. I really loved how simple this pattern was and how easy it was to modify. This is the first project that I've done major modifications to and it didn't end up in a complete disaster - yay! Notice that Day 16 is blank. I could not for the life of me remember what I wore on that day. It was right in the middle of the week, so it was a work day. I went back either the day after or 2 days after to write down what I wore and I drew a complete blank. But I'm pretty sure it was different than the other outfits. Hopefully. It is hard to come up with different outfits. Maybe I've lost some of my creative juice, but I started just switching up the shoes in some of my more-liked outfits and calling that new. If you look at Kendi Everyday, her outfits looked completely different each day. I did tend to not plan out my outfits until the morning of, so some more advanced planning could have helped a bit. I have a lot of clothes I don't wear. I usually have a few favorite pieces and then some more unique items that I can't/don't wear as much. In the future, I need to make sure I buy clothes that I really want to wear all the time. I bought that jacket from ModCloth right before 30for30 and that's all I wanted to wear, which is great. But then there is another sweater that I got from H&M that doesn't fit that great, and isn't that comfortable, so I don't wear it that often (and I didn't include it in my 30for30). I don't have a lot of color in my wardrobe. Well, I do, but I don't wear it that much. I wear a lot of grey and black (I would have looked like I was going to a funeral when I went to the career fair on 3/2 if it weren't for the pink headband I was wearing). Don't get me wrong, I love colors. But I also don't think it's such a bad thing to have mostly neutrals in my closet. If that's what I wear most, and I'm drawn to them in the store, then so be it. But I think part of the reason I like neutrals (read: black and grey) so much is that I can make a colorful knitted cowl and wear it with no clashing problems. I think the crafter in my has influenced my taste in clothes so that I can make anything with any color yarn that I find gorgeous and not have to worry about what I can wear it with. Working in an office makes this challenge more challenging. If I could wear jeans to work, I would have picked out more than just one pair for the challenge. I had mostly slacks I was wearing, which would be completely different from my style if I was back in school. I feel a bit like I have lost my style since I'm limited in my clothes during the week. I got 3 days (casual Friday plus weekends) of the week to wear anything I wanted, instead of the usual 7. Although now I'm working part time, so I will get 4-5 days of the week to wear anything I want. But working isn't really an excuse. I see cute work outfits all the time in stores and online, so there's no reason I can't wear something fashionable to work. Boy, this is a long post. I shall end it here, but I do have to talk about that knit cardigan at some point and the new cowl I'm working on. Oh, and Miriam is here to visit, yay! So maybe I will have some adventures to talk about later. I forgot one more thing that I learned - laundry! I usually do my laundry every 2 weeks, or around then when I get a chance...but with this 30for30 thing, I felt like I had to do my laundry much more often! Especially those jeans - look how many times I wore them! It will definitely be nice to wear other clothes in my closet for a while, and give those recently worn items a rest. Yesterday I tried this brilliant recipe for Filet Mignon in Red Wine Balsamic Reduction. I was drawn to it because it seemed so simple. Normally I steer clear of cooking meat because I'm not a very good cook...I can't really tell when it's done and I tend to overcook it. But this recipe for filet mignon looked so easy and didn't require that many ingredients, so I thought, what the hell, why not? I got a little less than 2 lb of meat, substituted more shallots for the mushrooms (ick!) and used regular wine (Red Diamond 2008?) instead of cooking wine. I also didn't cook very consistently; for example, I had to take the pan off the heat for a sec while I cut up the shallots (oops...). But the meat turned out great nonetheless, and I had enough for about 4-5 servings (it was so good I had to eat two slices out of the eight). I cheated a bit and served it over pre-made garlic mashed potatoes, but really, I can only do so much cooking in a day. I think this is a perfect recipe to make for dinner guests (or, even better, an indulgent meal for yourself). It's simple, quick, and turns out amazing results. Although make sure you have a corkscrew on hand if you're using a new bottle of wine...I had an interesting time trying to open a bottle of wine without one (it's possible, though not recommended). I included some things in parentheses just so I could remember the full outfit, but they aren't part of the 30 items. I still have to talk about the cardigan I finished knitting, but I will save that for later. On another related note, I made my first sale on Smashion! Yay! Sorry, no pictures, but none of the outfits were that fabulous anyway...otherwise, so far so good, right? The only problem I've encountered so far is that Spring is coming early. I picked out clothes mainly for layering or wearing alone in relatively cold weather (Bay Area Winter). But it seems that Spring has decided to intrude on my fun and make things all sunshine-y (and pollen-y). I can make do with a light blouse and pants/skirt, but that allows for much fewer options for outfits. We'll see how this goes. Tomorrow is the first day of the 30 for 30 challenge. 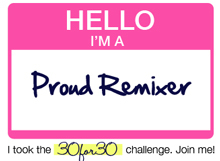 The idea is that you take 30 things you want to wear and "remix" them over 30 days. These things include tops, bottoms, light outerwear, and shoes (and don't include heavy coats and accessories). An added challenge is that you can't buy anything for those 30 days, you're just supposed to shop in your closet. I'm excited for the challenge but I'm also a bit worried that I'll just end up wearing the same thing every day. I work in a office, cubicle-style, and sit at my desk all day. It's typical business attire, so I usually wear slacks and a nice top, maybe a cardigan. The challenge for me over the next 30 days is to try and not wear the same outfits each week. Hopefully the accessories will help. Now I haven't picked out all 30 items yet, but if I do get to 30, one thing I won't include is any knitwear I finish. Which will basically be just my Malabrigo Abalone that I've been working on. It's almost done so I should be able to wear that soon. I'd love to take pictures of my outfits every day to document them, but given as I wake up (sometimes) before the sun rises and get back home after the sun sets, and I am only one person and am not about to take bad photos of myself in front of a poorly lit mirror, it's not very practical. Having someone take pictures for me at work isn't really an option either. Maybe if I have a really good outfit, I'll share, or on the weekends when there's light. So that's what I plan on doing over the next month. Which means I'll probably go on a shopping spree in March...especially since Miriam is coming to visit. This is what keeps happening when I try and open Ravelry. I'm dying here. I want to look at new patterns but I can't! I could open it on my phone but it's not the same, and it started slowing down and not loading all the pictures as well. *le sigh* Hopefully it won't always be like this on this computer/internet/server/thing. How exciting, 2011. Now it's going to take a whole year for me to get used to writing "11" at the end of my dates. I'm doing okay so far. I think I may actually have a new year's resolution this year. I know, right? I never have resolutions, or if I do, they are loosely kept. Carin from Round the Twist, a video podcast I follow, called them "guidelines." I love that, because really, "resolutions" just sounds like too much. p.s. Did you notice that I made the column width on my blog wider? Now I can make my pictures bigger. Yay!